Proponents of biologically inspired design (a.k.a. bionics, biomimetics, nature-inspired design, etc.) suggest that the method holds great promise for innovative design, often with emphasis on sustainability. Successful designs range widely across domains, including novel nanoscale materials, more sustainable “green” chemistry, high performing mechanical systems and sensors, waste minimizing infrastructure ecosystems, and more efficient and robust information processing algorithms, to name just a few. 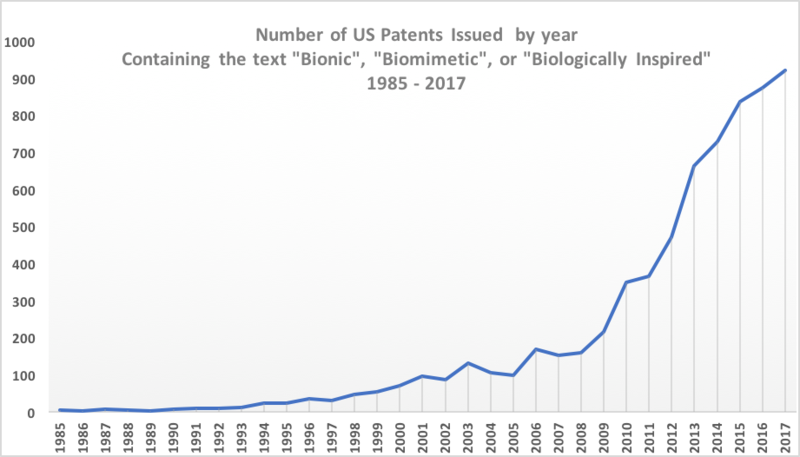 Analysis of the US patent database demonstrates increasing recognition of the value of biological inspiration, and exponential growth in the number of biologically-inspired patents issued over the last decade (source: US Patent database, http://patft.uspto.gov/). A 2010 economic analysis conducted by Fermanian Business & Economic Institute at Point Loma Nazarene University in concludes that “in 15 years biomimicry could represent $300 billion annually of U.S. gross domestic product (GDP) in 2010 dollars. Biomimicry could account for 1.6 million U.S. jobs by 2025. Globally, biomimicry could represent about $1.0 trillion of GDP in 15 years.” Both Forbes and Fortune list biomimetic design as one of the top five trends of 2017. Despite this promise, only a small number of executives polled at the Industrial Research Institute’s 2017 Annual Summit, were aware of any ongoing biologically inspired efforts in their organization, and only 1 industry executive rated their internal practice as advanced. That executive was from the pharmaceutical industry, where many drugs are based on natural products, and understanding how and why drugs are (or are not) effective requires substantial biological knowledge. In most areas, though, several key factors seem to be inhibiting the development of the practice: internal skepticism, lack of formal methods, and missing skill sets. While biologically-inspired patents and products continue to proliferate, skepticism is prevalent in nearly all organizations, especially among engineering groups. One form of skepticism is that biology cannot possibly apply to a specific problem or domain. While we do find some domains are more obviously connected to biology, we have yet to find an engineering or design related domain where biology has nothing to contribute. From the design of neurology-based CPUs to honey bee-inspired resources allocation algorithms for server farms to snail-inspired drills for drilling on the moon, biology has been a surprisingly versatile design partner. In our practice we know that a disciplined functional breakdown of a design problem universally reveals multiple entry points for biology, and a well-trained biologist can identify what may be less obvious analogies. It is worth noting that using functional breakdowns that can be interpreted by a biologist addresses two important misperceptions or about BID: that it lacks formal methods and the interdisciplinarity requires a highly unique skill set. In reality, the formal methods that already exist for biologically-inspired design allow a well-trained biologist to participate and rapidly add value in the interdisciplinary design process. Another common concern is that biological performance clearly is inferior to human system performance, so it cannot possibly help. We encounter this frequently in Aerospace and Defense, where performance standards and environments reach far beyond those of natural systems. Yet, NASA has a working group on the topic, DARPA has specific programs in bio-inspired designs for a number of applications (for example the Engineered Living Materials Program), and one of the largest Aerospace companies has at least 6 working projects involving biologically inspired design concepts. While it is often the case that biological performance is inferior in one dimension, it is often superior when considered across multiple dimensions. Biology is masterful at multi-functional optimization, and biological solutions are generally more material and energy efficient, yielding more sustainable and often, more robust solutions. Moreover, when biological patterns are applied using human materials and technology, those same “inferior” systems may yield superior results. Such patterns often lead to entirely new ways of thinking about the problem, opening up entirely new R&D paths. Addressing a problem more broadly, and understanding multi-functional trade-offs of biology again echoes need for both formal methods (problem formulation) and a deep understanding of biology (evolutionary constraints). A third criticism we encounter is that biology is great for inspiring new concepts and enhancing creativity, but the ideas are not practical. It is not uncommon for this skepticism to be supported by a repository of well-intentioned biologically-inspired ideas collecting dust on the shelf. We find such design concepts often are the result of heavy emphasis on the “inspired” aspect of biologically-inspired design, coupled with poorly managed expectations and little real investment in the process. There is no doubt that biologically-inspired design enhances creativity and can generate more diverse design concepts; however, the expectations and methods used to apply biologically-inspired design for a creativity-enhancing exercise are much different than when it is used to target innovative solutions for specific, difficult technical problems. In particular, the skills required to understand and apply biological concepts to difficult technical problems are much different, and eventually require consultation with specialists. Consider that some biologically-inspired design projects take years of study, experimentation and investment to yield results; but such projects result in transformative, competitively defensible innovation. Executing on this type of project, what we call Deep Biologically Inspire Design, requires an understanding of the methods that are most likely to yield ideas that will translate into viable, manufacturable product, and employing a team of resources with the technical capability to understand and execute on those ideas. Interestingly, the trajectory of BID patents and economic value suggests a strong parallel with basic biology. It is well known that populations introduced into an open environment experience unconstrained, exponential growth. As individuals accumulate, populations experience competition from other species that can slow or even halt their increase. The pre-existing storehouse of biological knowledge has fueled the rapid expansion of BID, but this cannot continue indefinitely; at some point all the low hanging fruit gets picked. Deep Biologically Inspired Design will not only yield immediate payoff, but is critical for those who wish to use biology as a source of inspiration in the future. What makes a good BID project? What’s a biologist to do (to be good at design)?